Marbella is geographically blessed with so many breath taking natural vistas that one could be almost anywhere in the area and catch a glimpse of the sea, mountains or the Andalusian hills that create a magnificent backdrop to life in this renowned spot on the Costa del Sol. It is not just natural beauty that attracts visitors and permanent residents, however. We are naturally biased, yet we happen to think that Nueva Andalucía, our specialised area of know-how, has something to offer everyone. Property seekers are spoilt for choice with the gently undulating fairways of the many golf clubs here offering calming views stretching to the deep blue of the Mediterranean. Delightful apartment complexes deliver the perfect solution for golfers seeking weekend escapes, while privileged luxury villas are tucked away in their own sub-tropical grounds for optimal comfort and privacy. Villa or apartment not for you? Not everyone appreciates the amount of upkeep necessary to maintain a villa, while conversely neither is living in an apartment everybody’s dream, with neighbours potentially living on all sides of your home. In which case, we suggest you consider a townhouse. The perfect ‘halfway’ solution, a townhouse offers the independence of a villa, having no one either above or below, yet is generally set in communal gardens with a shared pool that is maintained by the community. All of the upsides of a villa with none of the downsides! Interestingly, the concept of the townhouse has shifted in recent years, with the ‘terraced’ homes of earlier models giving way to veritable villa-style properties. Contemporary townhouses are more spacious and finished to luxury standards, with features more anticipated in exclusive single villas. The rows and lines of the previous generation have also been banished, with these family homes placed thoughtfully within beautifully landscaped gardens. 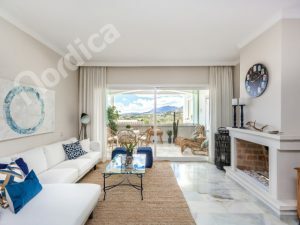 Nordica has a wonderful selection of townhouses for sale in Nueva Andalucía and would be delighted to discuss your requirements. Pop by our office and we can tell you about them!